Have You Seen Wally Lately ?? Whether you know him as Wally, or Waldo, Willie, Walter, or even Charlie (depending on where you are in the world)…. most of us have spent many frustrating/entertaining hours trying to find him in one of the famous “Where’s Wally” picture books. I recently decided to start to add something a little “extra” to the Google Virtual Tours that I create. I thought that by subtely including some sort of character or figurine to my Business Views, I could make it a bit of a “signature” of my work – but at the same time also add an extra element of interest for the business (and potentially their customers). 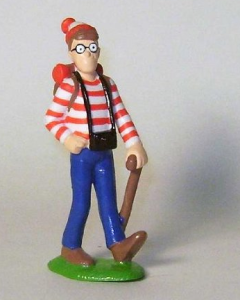 Actually finding a Wally figurine was harder than I thought (as they went out of production more trhe 25 years ago)… but I did manage to track some down, and have started (with my clients permisison), incorporating them into new Virtual Tours that I publish. So far all my clients have loved the idea… it provides something a little quirky for their virtual tour…. and also gives them the potential to run a competition or offer a prize tpo encourage potential customers for taking a long hard look through their virtual tour.